What good is four-to-five cores if you're not going to crank out some high-quality games to go along with it? That's the question NVIDIA had to ask itself. Thankfully, we're getting the answer in the form of some brand new quad-core-optimized games coming to the Tegra Zone. Perhaps the most recognizable name on the list is Sonic the Hedgehog 4: Episode II. In a follow up to Sonic the Hedgehog 4: Episode I, available on the Market now, the sequel is bringing a new set of effects and updated graphics to the classic console games. NVIDIA says the new game will run on Tegra 3 devices cranking out up to 720p HD resolution. Additionally, the game will bring back Tails, fulfilling his usual sidekick role alongside his big blue buddy. True to the original Genesis version of the game, you can even play a co-op mode with a friend controlling Tails. Episode I was already a fun game, so we're looking forward to seeing this new version and arguing with our friends who gets to be Sonic and who has to be the immortal sidekick. 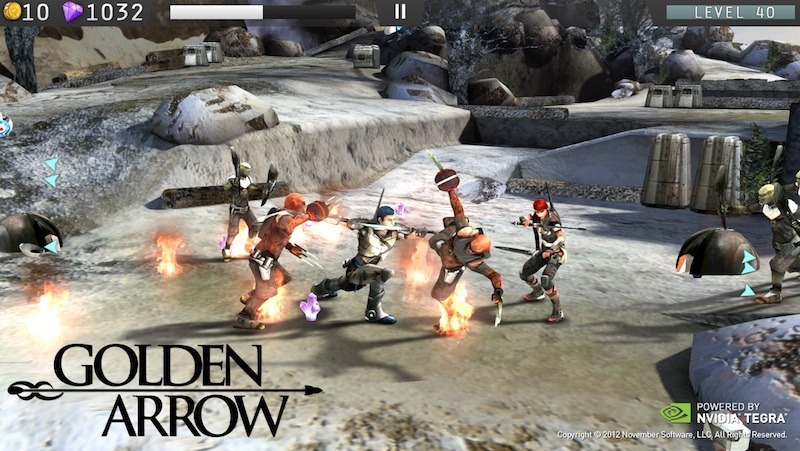 Arriving for the first time on Tegra 3 devices, Golden Arrow is an action adventure game. We're promised "higher-resolution textures, high dynamic range lighting, soft shadows" along with "lens flares, explosions, and fires galore." Yup, this description was definitely written by NVIDIA. Still, if there's any Michel Bay fans out there who are looking to get the same thrill from their mobile gaming, NVIDIA is coming for you. Transporting from the PS3 to the mobile gaming circuit is Dark Kingdom, a role-playing game. In the game, the player is trying to find the his missing father at the tower of the gods. You collect spirit and rune stones to upgrade weapons, armor and skills. It's no Skyrim, but the world looks pretty fascinating. If you're looking for some more graphics processing buzzwords, this game even advertises some rag-doll physics. Fancy! Built on the Unreal Engine, Eden to GREEEEN pits you "against alien machines from another planet" (so we can conclude "alien" doesn't mean "immigrant" here) who are trying to steal Eden's natural resources. It's up to you to save Euphoria, the natural energy of Eden. This totally original story comes with the descriptor "freemium", so we can probably count on some sort of in-app purchases, but NVIDIA promises Eden to GREEEEN won't "skimp on the gaming experience." Fingers crossed. The last of the new games NVIDIA is announcing for their Tegra 3 devices, Hamilton's Great Adventure is a strategy/puzzle game that actually seems mildly reminiscent of some of the newer 3D Super Mario games. NVIDIA even claims that the "fully dynamic levels" will "rival what you'd experience on the PC version of the game." The game has been adapted from Bitsquid's DirectX 11 engine. The Tegra Zone app is always adding new games, but it's nice to get a peek behind the curtain and see all the work that's being done to bring large-scale PC and platform games to Android. As a platform, Android has the potential to turn into a really solid gaming system, if only developers will support it. NVIDIA is doing its part to ensure that developers make their way over to the Google garden. I, for one, couldn't be happier about this trend.